If you are not familiar with Microsoft Live Search, you may want to read Microsoft Live Search Overview. Microsoft Live Search works just like any other search engine. Type in some words and it combs through its database of web pages attempting to return matches that best suit the words you typed into the search. The words typed into the search engine are called a query, and the listing of pages displayed is called the search results, or simply the results. Back when Windows first came out, Apple Computer sued Microsoft because it had the same look and feel as Apple’s operating system. The court ruled that the “look and feel” of something can’t be copyrighted, and Microsoft’s business model has been set ever since. No doubt Google’s lawyers had to explain the ruling to its executives once or twice, because the Live Search results look exactly like Google’s search results. 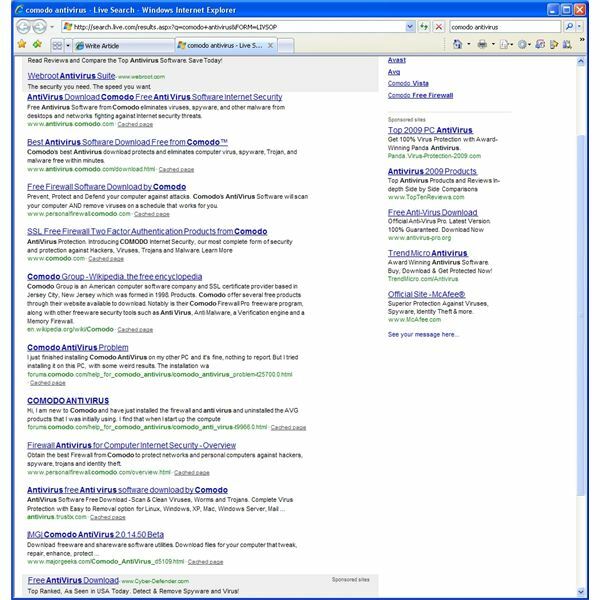 The top results are highlighted in gray and are paid ad placements, which are not necessarily the best matches for the query entered. Then, the results displayed along the right side of the window are also paid ad placements. So far, so good, if not innovative. Of course, no one is trying to win a design contest here. What people care about is, are the results any good. To test, we ran a series of searches. The topic is Comodo Antivirus. Comodo is hardly a secret, but it is not a household name either. The term “antivirus” gives us a good search engine test because it can be spelled multiple ways, it is a generic term that is used without Comodo, and there are plenty of ad filled junk sites out there that target the word antivirus. Finally, Comodo is better known for its firewall software than its antivirus product. What grade does Windows Live Search get? 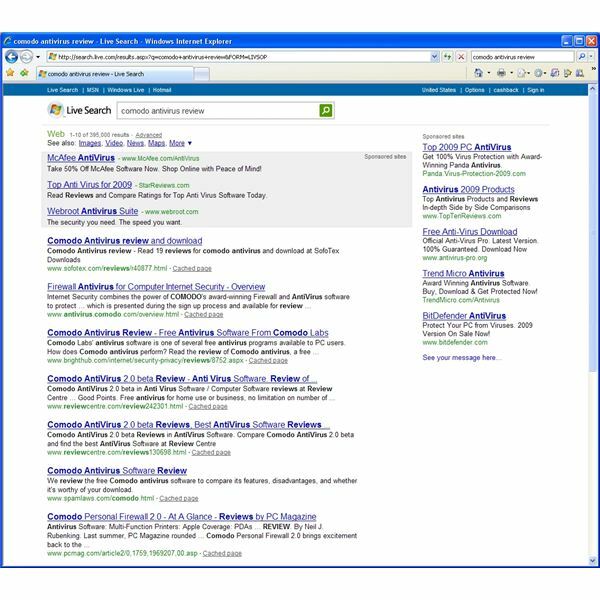 The search for comodo antivirus (no quotes) yields 795,000 results. The top search result is the official product page for Comodo Antivirus. That’s good. The next six results are on the official Comodo website, with the exception of the Wikipedia entry. We aren’t going to quibble with what page should be 4 and which page should be 5. For this first glance, we only care if the results are useful. The first site that is an unknown is the 9th result. The result is from a page at trustix.com. The only result on the page that even has the word Comodo in it says “Comodo Product”. A bit of research turns up that Trustix is long out of business, having been bought by Comodo and then shuttered in December 2007. We’ll have to call this one a “bad” result. The 10th result is the download page for the Beta version of the software from Major Geeks. Major Geeks is a large site and therefore has some pull. One might argue that this isn’t a very good result since the only thing on the page is a copy and paste from Comodo’s copy and download links. But, a two word search can only give the search engine so much of an idea of what you actually want. In this case, Live Search is giving you a way to download what you searched for. That can’t be regarded as a wrong result. On the first page we get 9/10 “good” results. So far, the first glance looks O.K. Let’s go a step deeper with Part 2. Interested in taking a look at what Windows Live Search can really do? Want to dig a little bit deeper than those one pagers that barely skim the surface? Then you’ve found what you are looking for.